This article is about MEG - Madras Engineer Group. For other uses, see MEG (disambiguation). Madras Sappers review order by Richard Simkin. Madras Engineer Group (MEG) (Informal: Madras Sappers) is a regiment of the Corps of Engineers of the Indian Army. The Madras Sappers draw their origin from the erstwhile Madras Presidency army of the British Raj. This regiment has its HQ in Bangalore. The Madras Sappers are the oldest regiment of the Corps of Engineers. They are also the only regiment of the erstwhile Madras Presidency Army to survive the post-1857 reorganizations unscathed. The thambis, as the troops of the Madras Sappers are popularly known, with their hallmark Shakos have distinguished themselves in many battlefields around the world for more than 200 years. In World War I they became particularly famous for inventing the mine clearing torpedo that goes by the name of Bangalore torpedo. The second half of the eighteenth century found the East India Company involved in the politics of India and in conflict with the French and a number of native states, amongst whom Mysore, the Marathas and the remnants of the Mughal empire were prominent. The newly-raised army of the Madras Presidency was deficient of combat pioneers who were raised as 'ad hoc' companies and disbanded after the conflicts. The First Anglo-Mysore War highlighted this deficiency and led to the raising of two companies of the Madras Pioneers on September 30, 1780 at Fort St George. These men are the forefathers of the Madras Engineer Group of today and the Corps of Engineers of the Indian Army. The Madras Pioneers formed an integral part of the armed forces. Their principal job in active warfare was to dig 'saps' or 'trenches' which permitted cannon to be brought in range of enemy fortifications and to dig 'mines' which would explode creating a breach in the fort walls. Hence the name, Sappers & Miners. In addition, the sappers used to lead the way to the breach for the 'forlorn hope' and infantry to follow. They also built roads, bridges, fortifications, wells, water-supply and fought as infantry when needed. Since this group was constituted by the Madras Presidency, and formed part of the Madras Army, they were called the Madras Sappers. Likewise in 1803 and again in 1824, the Bengal Sappers and Bombay Sappers were formed in the other presidencies. 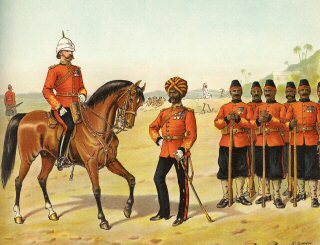 The Madras Sappers recruited and trained small tough and wiry men from South India. These engineer troops fought in numerous campaigns in India at Sholinghur, Seringapatam, Assaye (along with Major General Arthur Wellesley, later Duke of Wellington, and also in Egypt, China, Burma and other places abroad. The Madras Sappers moved into Bangalore in 1834, when they were involved in a major part of the construction activities of the Civilian and Military buildings in Bangalore. Their association with Bangalore, where the Centre is located, continues to this day. The motto of the Madras Sappers is that common to all three regiments of the Corps of Engineers, Sarvatra (Sanskrit:Everywhere) the Indian equivalent to 'ubique', the motto of the Royal Engineers. Sphinx symbol depicting the campaign in Egypt, 1801. Elephant emblem depicting the Battle of Assaye, 1803. Dragon symbol depicting the campaign in China, during the First Opium War, 1840. The battle symbols of MEG are, a sphinx to commemorate the victory in Egypt in 1801, an elephant for the victory in Assaye in 1803,a dragon for China(1848), a bighorn sheep for Zoji La(1948) and a tank for Basantar(1971).